SMART SPEAKERS: AUDIO, HOME AUTOMATION, & VIRTUAL ASSISTANTS Across all U.S. demographics, the appetite for home technology is growing. Those who already own some type of device and expect to make another future purchase are currently showing the most interest in smart thermostats (40 percent), keyless entry for homes (33 percent), and smart speakers (38 percent). But the smart device that is gaining the most interest from advertisers is the smart speaker. We have become accustomed to one device (the smartphone) replacing multiple information and entertainment devices for some time; the expectation going forward is that all smart devices will operate on the same software and communicate with each other, essentially adopting an integrated ecosystem that synchronizes products and services into fewer and more powerful devices (the Internet of Things, or IoT). Current products such as smart speakers are positioned and marketed as the hub in this integrated ecosystem. Based on a recent Adobe survey of more than 1,000 U.S. consumers, more than half of consumers who own a smart speaker use it at least once a day and 81 percent use their device at least once a week. According to Adobe Digital Insights, sales of smart speakers grew 103 percent from 2016 to 2017. These internet-enabled, voice-activated, in-home devices reached 11 percent market penetration in 2017, which is expected to grow in the coming years. According to a 2018 CIRP study, Amazon Echo is the current market leader with 70 percent of the market share. Google Home trails in second place with 24 percent, and Apple’s Home Pod has a lot of catching up to do at just 6 percent, possibly due to its relatively new appearance on the market or comparative lack of capabilities when looking at the Siri virtual assistant next to Google. 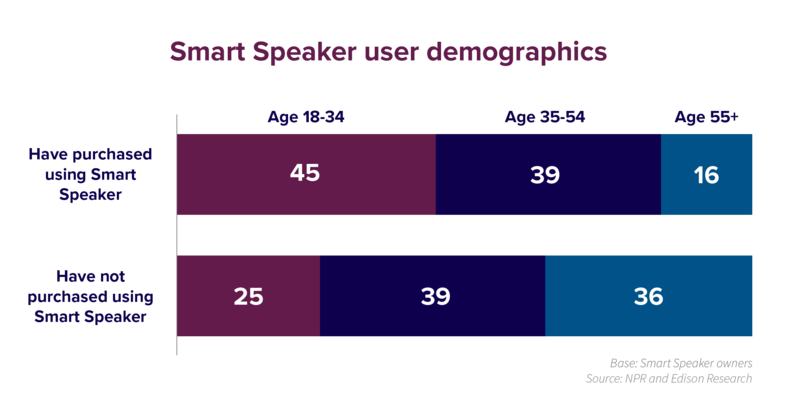 Millennials and Gen Z, and even more specifically those aged 18 to 34, are 42 percent more likely than other age groups to own a smart speaker. Of these, one of the largest groups is millennial parents. Nearly 10 percent of Google Home‘s digital content engagement is kid-related, which may explain the high impact level of Gen Z usage. Because much of Gen Z lives at home, they are still greatly influenced by their parents’ usage of smart home devices. With the acquisition of more devices to cover the home, usage will continue to grow. Based on a recent Adobe survey of more than 1,000 U.S. consumers, more than half of consumers who own a smart speaker use it at least once a day and 81 percent use their device at least once a week. Nearly 80 percent use smart speakers to play music, but over half use it to obtain information like news and weather (63 percent) or control smart home devices (52 percent) and set alarms (53 percent). In addition, interest in and comfort level with using digital assistants to complete basic tasks (such as making a restaurant reservation), and more complicated ones (such as selecting a restaurant, inviting guests, and coordinating schedules) are increasing. The growth of digital assistant penetration is consistent with the rate in which products with mainstream growth take off, such as smartphones and tablets. It is projected that digital assistants will have 50 percent penetration by 2020. According to Adobe, nearly all of the users who had a voice assistant talked to it every day. One in two smartphone users now use voice technology, with nearly one-third using the technology daily. Smartphone assistants have been available to users for several years, so it is not surprising that this exposure seeded the smart speaker user’s comfort level with the idea of a voice assistant. This concept is reinforced by the fact that 42 percent of voice assistant smartphone users intend to purchase a smart speaker. In the future, users will increasingly rely on their speakers to make purchases. Currently, 44 percent of owners have made an online purchase via their smart speaker. A user’s trust in a personalized product showcase or suggestion by a smart speaker is still relatively low at 39 percent, but this may be due to recent adoption. Up until now, voice purchases tended to be standalone, lower-value items. But with over half of all smart device users searching for a product via voice commands, the popularity of voice devices is proving to be the first challenger to touch and typing as the primary interface of consumer electronics. Barriers of adoption include cost, but also privacy concerns. Data collection is concerning to some users as companies collect all the usage information that flows from these devices. 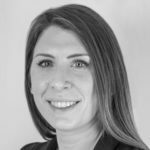 While marketers could apply user data to help tailor targeting and messaging their campaigns across devices, data ownership is also under discussion in the current privacy-sensitive environment. MEASUREMENT & PURCHASE BEHAVIORS: Beginning in March 2017, research companies like comScore started rolling out measurement capabilities across all connected home devices to understand the behavioral changes these products are driving for consumers. Using its proprietary Total Home Panel, comScore’s Connected Home initiative leverages user data to deliver insights into connected-home product usage, including computers, mobile phones, tablets, streaming sticks, smart TVs, and other IoT devices. Given the evolving landscape, these measurement solutions will play an essential role in framing who exactly a connected home user is as well as how, and how often, they interact with their in-home devices and voice assistants. This data can help keep brands in communication with their customers while improving user experience and providing unique opportunities for those who invite brands into their home, such as leveraging smart devices as a conduit of support or service. NEW “IN HOME” AD SPACE & AD SELLERS: In the next few years, current companies will explore new business models or core competencies as this smart home landscape continues to grow. Telecom and cable companies will begin to leverage their existing infrastructure to sell and service Smart Homes as a Service (SHaaS). This would allow traditional telecom and cable companies to expand their foothold with current customers since they already have access to a large number of homes. As their footprint expands within the home, these companies could further leverage customer data by targeting across multiple platforms within the home. It is also possible for these companies to partner with traditional CPG brands to explore wearable or health-and-wellness devices that are used both in and out of the home. VOICE COMMAND THROUGH VOICE ASSISTANTS: Led by the expansion of smart assistants and smart speakers, “command” or “click-to-call” via search or review sites will be the next area to see growth as voice commands or voice assistants become more commonplace. Currently, businesses receive nearly 33 percent of calls from vertical search and review sites. The next logical step after phone calls would be more advanced tasks being made via voice assistants, including purchases. Smart speakers are not only for reordering regular shopping list items but also for making first-time purchases. Already, 44 percent of consumers use their smart speakers for reordering while nearly the same (42 percent) use them to make a first-time purchase. This action is now somewhat mainstream in the travel, banking, and healthcare categories. Within travel, voice assistants are being used to book or check the status of flights or hotels. Checking statements, balances, and paying bills online will now transition to the voice assistant as the next wave of banking development. Finally, healthcare symptom search and diet tips are easily accessed via voice assistant. SMART APPLIANCE PRODUCT REORDER: Beyond just smart speakers, smart appliances connected through smart home networks will also allow access to brands and help to build brand preference through the opportunity for easy reorder. As mentioned already, voice assistants are able to make suggestions or recommendations for products based on usage data. As more devices become interconnected, smart appliances such as refrigerators can recognize when a preferred brand or product is running low, add it to a person’s shopping cart in their smart device, and allow them to quickly reorder based on verbal commands. As this becomes more mainstream, making it as easy as possible to find products will be key, since consumers are typically searching for something specific. Tailoring search terms to include product differentiators will only increase the chances that a product will be found. AUDIO PRODUCT ADS ON SMART SPEAKERS: Of course, suggestions based on prior usage is only helpful for brands that have already connected with that consumer. 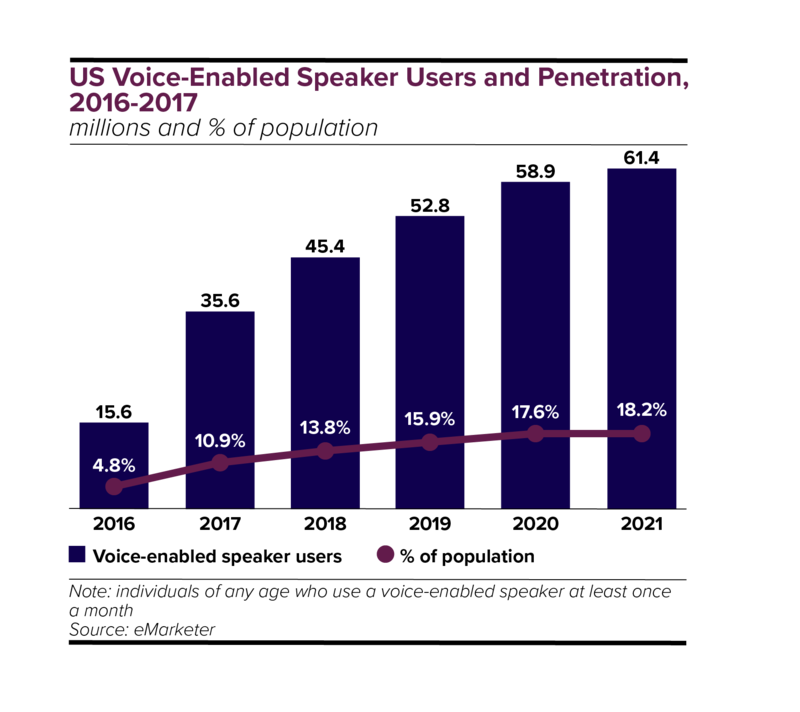 In late 2017, Invoca released data that provided insights on how comfortable smart speaker owners are with the idea of ads on these devices. It found 30 percent of respondents said they would be okay with ads via voice assistants if they were asked about hearing one before it played. In addition, 28 percent would be open if they chose the brand from which they receive ads. One in four would allow personalized ads based on their interaction with their digital assistant, or from brands they follow on social media, and nearly 20 percent of users would be okay with ads embedded in answers from the voice assistant. Taking personalization a step further, voice-enabled digital advertising, or cognitive ads, allow viewers to “talk” with a brand’s ad and request information with a simple phrase. Results are already promising, with time spent with ads exceeding one-and-a-half minutes. A handful of blue chip advertisers are continuing to test these ad types including Toyota, Campbell’s Soup, and Unilever. sponsor current unanswered voice assistant questions, or become the preferred brand in response to a query. The role of traditional “screens” is in a state of transition. It is possible that, in the future, voice activation could displace screens as the primary way in which we communicate. Screens could be replaced by AR glasses or smart ear buds that will be controlled via voice commands. Screens big enough to share content with others will continue to be important, but individual screens may be reduced by half of what we have now. It is also predicted that typing will go the way of flip phones, and voice commands will take the lead. Smart speakers (and recently smart displays) have seen a significant uptick in growth over the last few years, particularly with millennials, who have made these devices the epicenter of their home ecosystem. The convenience, approachability, and comfort that smart speakers provide to their user will advance their hold on the home for the foreseeable future. Given how integral these devices will become over time, it is important for us to consider how this will affect the voice-command landscape in the future. Keeping brand names and simple brand attribute phrases top of mind with consumers will be critically important as the voice assistant landscape grows and paid opportunities and sponsorships become available. Brands who begin to incorporate a voice assistant or voice search strategy into their current campaigns will benefit by reaching the millennial and early adopter audience; however, full audience penetration is not far in the future.